The 4th day of TGS saw the reveal of a couple of new trailers for content coming up in October. I’ll be going over the bits I’ve got any thoughts on. The complete summarized rundown is on Bumped as always. Despite there being only two trailers (of the main things, anyway) there’s quite a lot to go through. Just including the main two trailer that will form the bulk of this post in this section. There’s a third more minor one I’ll go over at the end. While only the usual handful they add in these kinds of updates I think they’re an interesting handful in my opinion. Speeds up the photon art and strengthens normal attacks. It seems like normal attacks gain an extended photon blade during the attack animation, though it’s hard to tell from the demo if this actually increases range or if it’s just for show. It would have been nice if the demo had used it on an enemy that didn’t have super-armor frames on to see how the full charge looks now. If it does significantly increase normal attack range, then this is a good buff for swords in general as their normal attacks always had plenty of power but surprisingly small reach for how large the weapon is. This would also greatly help with the PP issues that sword can have, as you should more reliably tag enemies for PP recovery as long as the buff is up. Hold down the button to go sailing through enemies. It drains PP as you’re channeling it, so it’ll possibly last as long as your PP does. It’s one of those silly looking customizations that I can’t help but like. Kick up and up and up and up. Holding the button down extends the length of the rising part of the attack, which could be very irritating for other party members. Finally you can be like Giliam in the original PSO2 OP movie. Aside that, having a controllable high-mobility PA on Rifles might be interesting. Might look a bit derpy on non-cast characters, mind. No longer launches you backwards and greatly increases its power when charged. Bullet Bows are still lacking in good AoE attacks, so this should be a welcome addition for those specializing in them. Moves you towards the target before casting and is more powerful when charged. That’s about it, not a hugely interesting customization on the surface of it. However, it may be useful for melee-Techers as a gap-closing skill as presumably the gap-closing part won’t require you to charge the PA. If it does then it’s a bit less useful for that. Surrounds you with dark orbs which deal pulsing damage to enemies on contact. Could be a interesting addition to a melee Techer’s arsenal, though it depends on how long the orbs persist for. The orbs do flinch enemies, so it may also be a handy protective barrier against trash mobs for all casting types. I think Ramegid and Sacrifice Bite got the most interesting changes, because both of them will potentially have a large impact on game-play. It’ll be more clear when these are released and we can experiment with them. New Skills: Summoner Quality of Life. Summoner will be gaining two new skills; Share Assist and Long Distance Love (daww). Share Assist appears to allow support effects to transfer between pets when you swap pets or weapons. Not sure how big an issue this was for Summoners, but it may mean you won’t have to re-cast support techs as much. Long Distance Love is probably the most major one, as it allows you to initiate Pet Sympathy without having to recall your pet to you to get it inside Shifta/Resta range. Another major quality of life fix is your pet’s HP and status effects will display on the palette. I’m not sure why this wasn’t a feature from the beginning, as you’d think this is the kind of thing that’d come up during play-testing. It’s great that they’re finally implementing it, but all the same it’s baffling that it took them this long to do it. I’m not sure if this is the “Skill re-balance” they were hinting towards on the long term schedule, but if it is I’m kind of disappointed. Not because these are bad changes because Summoner needed some help and I like what they’ve proposed. It’s just the name indicates that there’d be changes to most if not all classes, not just the one. We’ll see I guess. The three basic pets; Wanda, Torim and Ceri will be gaining upgraded versions of themselves. Jinga, the upgraded Wanda. It appears to gain a zig-zag motion, possibly extending the width of its dashing attack. Aero, the upgraded Torim. Aero Spiral seems to have a larger range than Torim Spiral. Popple, the upgraded Ceri. Popple-plode seems to have a larger radius than Ceri-plode. Beyond that, it’s not really known how these pets are superior to the old versions. I’m not sure if you can just consume the upgraded egg or if you have to feed it to the base version to “evolve” it. However the demo shows them using a 7* Jinga egg to upgrade a 6* wanda, so it may have similar restrictions to the pet-ability swap/rarity upgrade mechanic. That is to say; you may need an egg of equal or greater rarity. If this is true, it’s going to be awkward to upgrade any 13* pets you currently have. Reduces charge times when you combo from a PA to a Technic. I can’t see this being terribly useful for BoHu or really in general. Seems like a waste of space, but maybe Jet Boot mains can correct me on this. Allows you to perform an air reversal in the air. This could be really useful. While Just Reversal is trivial enough with practice, its main weakness is it leaves you vulnerable to being juggled to death. This ring should prevent that, by turning a knock-back into i-frames, which mechanically should greatly increase your survivability as long as you’re paying attention. Extends the duration by slowing the Dive Roll speed. Increases movement speed if you jump during the [Step] action. The video demonstration shows it’s a fairly large increase in movement speed. Could this be the return of step-jump for faster movement over long distances? Hopefully not, but the increase in melee mobility is always welcome It’d be a fair boon if this ring allowed you go skip straight to maximum running speed upon landing, mind! Unfortunately the demo doesn’t show this either way. The other side of this is you can buy and sell skill rings, which is interesting. I’m not sure what kind of restrictions might be put in place on them, if any. This could work out great for players who are willing to spend the extra time gathering for profit and for those players who just plain don’t want to gather. Given the cost of creating and upgrading rings however, it remains to be seen what kind of profit margin people might be able to make with this. Rejoice, those who despise Episode 4 for going to Earth because we’re heading back to something resembling the science fiction setting again. The next chapter of the story quest is set on a moon base, where Hitsugi is currently being held captive. Battle your way past Mother Cluster apostles such as Phul and Och, possibly Kohri based on the data-mining and who knows who else! The moon base itself doesn’t seem like a terribly complicated map, given it’s just a straight corridor. That said, I guess it’s reasonable for a field that’s only going to be available in a story quest. The background music incorporates Beethoven’s “Moonlight Sonata”. Later on in the month, additional story board events will be added including a fight between Huey and Phaleg and finally re-uniting with Matoi. This reminds me, I am actually considering doing story summary posts now thanks to story translation efforts by multiple people. More details on that when the time comes. 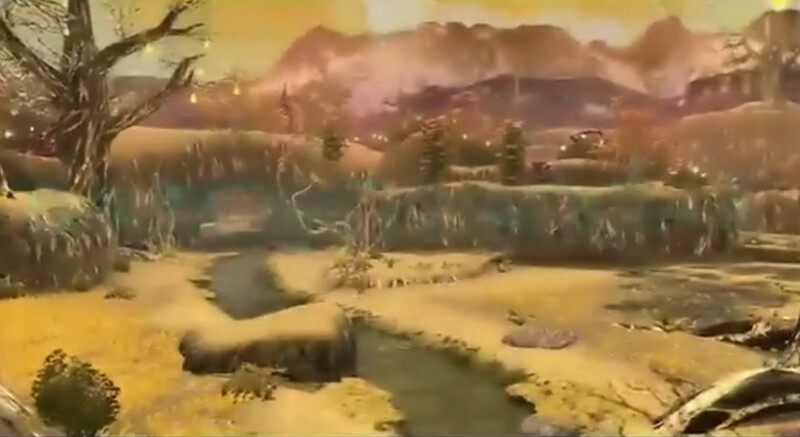 The second trailer showed some new bits about Ultimate Amduscia. Boooo. The inclusion of a teleporter is bad news in my opinion, because with it the quest will likely never get started once interest wanes over time. Initially it won’t be a problem because people will be running them a lot, but let’s see if that’s still the case 3 months down the line. Presumably they felt the need to include this because they wanted to prevent the return of Anga farming. By syncing up all the players at the start, you can put Anga at the end of the quest, making sure you can’t just shortcut your way to it. The downside however will be you can’t join the quest once its begun, nor can anyone join you after you begin it. The result is if your MPA isn’t full you get to sit there and wait, which is something you don’t suffer from for the other Ultimate Quests. Good luck getting randoms to agree to go in with lower numbers! Anyone who’s had issues getting Riding Quests, Challenge Quests or the recent Odin Limited Quest started should know what I’m worried about. It looks like it might be a fixed-layout quest, which I don’t mind. It does run counter to the spirit of the other Ultimate Quests however which functioned more like free fields and it may have the unfortunate effect of making the quest much more repetitive. However, a fixed layout does give them the potential to engineer more interesting encounters than a random number generator could create, so I’m interested to see how it all works out. Curiously, if you follow the trailer you’ll note that they’re at varying point totals at different parts of the map between obviously different runs. Maybe the route through the quest is randomized even if the map isn’t? The main enemies are weak to lightning element. Much like the other Ultimate Quests, you’ll need to amass around 2000 points to clear. It seems the encounters during the quest are randomized enough, though the demo seems to show that a boss encounter happens in the same place (the center of the map) with Deadlion, Gilzoras Drago and the new Anga Fundarge. These all seem to occur around the 1200 point mark. It may pick a random boss to have as the final encounter in the quest if defeating it earns the rest of the points, which should be OK. I don’t think we’ll be in danger of people abandoning the quest if Anga doesn’t spawn as long as the collection files are relevant or their drops are decent. Speaking of drops, this is no doubt what a lot of people were most eager to find out. What kind of gear can we get? As was expected , the quest will come with a new collection file with which you can obtain the “Gicks” series of weapons. Though along with these, apparently other 13* weapons will also drop from the quest. Gicks Sword comes with a rather impressive 1333 attack, though it’s unknown exactly how much of that is made up by affixes. If we assume that Deadlion Soul comes with the standard +35 S-atk then its +50 attack with Ability 3, bringing it down to an estimated 1283 attack which is still huge. Austere Calibur in comparison has 1161 S-atk at +0, so its looking like these will be making the Austere series obsolete if they come with a solid potential. After many years of 11* units, we’re finally making the transition to 12*. It appears that there’ll only be 1 complete set and a bunch of boss parts for others. While their stats are unknown, the blue-wing unit appears to start with 225 S-Def which puts it on par with the Tagami units if so. This potentially makes Saiki and Austere units superior for defense in terms of raw stats, but of course we don’t know what set bonuses they may come with or what inherent bonuses they may have. What we do know if that even if they’re statistically weaker they come with one very important mechanic that makes them blow all 11* units out of the water; you can slot L / skill rings into them. Take one ring, 100,000 Meseta and 1 Lambda Grinder to fuse a ring with your unit. Once you fuse the ring, the ring is consumed and you won’t be able to get it back. Note that this only works with Left rings and it will also bind the unit to you. Alright, there’s one more trailer to go over quickly! The 2nd part of the Phantasy Star Universe anniversary crossover thingamajig was revealed. This time, the focus is on the Phantasy Star Portable games mostly, also featuring a shirtless Howzer because why not. Shirtless Howzer is kinda awesome to be honest, he reminds me a bit of Liquid Ocelot You’ll be able to get Helga, Vivienne and Emilia costumes and accessories. Howzer and Helga’s costumes will be layered wear. This time, the lobby NPCs will be Emilia and Vivienne. They’ll come with the usual Client Orders, obtainable Partner Cards and obtainable 13* weapons, with Clarita Visas NT and Vivienne. Both weapons will have editable photon colours. Anyway, looks like that’ll be all for the Phantasy Star Universe anniversary. Kind of a shame we didn’t see anything Laia turn up but that’s how it goes. I originally thought there were going to be three parts based on the fact that we had three major characters on the promotional artwork, but there’s nothing on the schedule for it. Kind of a blow for fans of the Guardians Formal outfit. That’s finally all I have to write about! Long post, but there was a lot of stuff they revealed on the 4th day of the TGS. As far as I know there’s nothing else to announce, but i could be wrong. Let me know in the comments if I got anything wrong or if you have any observations of your own you’d like to add. Thanks for reading! It was data-mined a while ago that Ultimate would be arriving in some form and last night’s reveal sure did confirm it and then some. As was guessed, the field is altered from its original incarnation and the natives are very different as well, at least visually. You can see it in motion in the 2nd half of the teaser embedded below. The first half concerns content I’ll chat a bit about in another post. As is usual with post-stream content, expect compression artifacts in imagery. If Sega releases an HD version of the trailer or some outright screenshots I’ll replace these as appropriate. Ultimate Naberius Forest. Shares the sunset hue with Forest Ultimate from PSO. The slightly worrying thing about this reveal is that it’s apparently a quest type as opposed to an additional difficulty. Both Extreme Quests and Advanced Quests have limitations on them. These limitations are not without reason, but they’re limitations all the same. Essentially the worry is they could place some annoying restriction on the quest type that may mire the experience somewhat. Regarding the experience, what is there to expect from the quests with regard to that? Well it seems to ditch the old 3 areas per planet approach present in the rest of the game, dragging monsters from other fields into the fray. Heck, it technically drags monsters from other planets entirely. The monsters themselves, while being visually distinct as mentioned, may also have new behaviors not seen elsewhere. At least I’d hope they do, or else it would be like playing any other quest in the game. Ultimate De Malmoth, with some wicked headdress. This giant feathered beast is clearly using Vol Dragon’s skeleton. Now, clearly there’s no where in this list a Meduna or Vol Dragon reskin can fit, so hey there were some genuine surprises! Unfortunately if there’s any more information it hasn’t arrived to us yet as the file these names are present in has so far not been included in the pre-patch. For that matter, the executable isn’t in our hands yet either! Ultimate Quests are set to arrive some time in the winter.